Batfish are a unique group of fishes containing only five species, all within the genus Platax. Batfish are prized in aquariums for their showy size and personalities. Being such large fish, they are frequently found on display at public aquariums where they are often kept in groups. 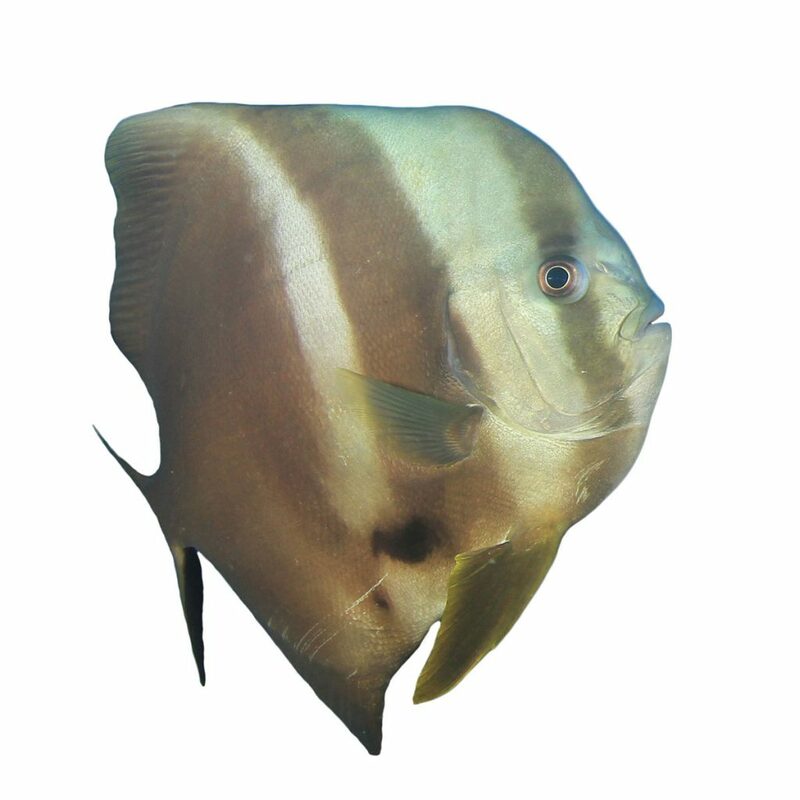 The Orbic Batfish (Platax orbicularis) is one of the most commonly sold species of batfish. Other common species include Pinnate Batfish (Platax pinnatus), Sterbai Cory Cat (Corydoras sterbai), and the Teira Batfish (Platax teira). Batfishes have a large natural range, being found throughout the entire Indo Pacific. They are relatively large, disc shaped fishes with muted coloration. Most individuals are hues of silver, brown or black as adults with yellow on some of the fins. The largest batfish reach approximately 28” (70cm), though several species stay in the 12” (30cm) range. Batfish can make great aquarium inhabitants, provided their husbandry needs such as diet, water quality and tank space are met. Because they are such large fish with pelagic behaviors, batfish are suitable for only the largest aquariums. Even a relatively large home aquarium can become too small for a moderately sized adult batfish in a short time. One of the most interesting aspects of batfish is the stark difference in appearance between the juveniles and adults. Juvenile batfish such as the Pinnate Batfish (Platax pinnatus) display extremely attractive coloring, presenting with a jet black body edged entirely with velvety orange fin margins. As the fish mature, they lose this patterning in favor of the silver body of the adult stage. It is important to consider carefully the decision to purchase a batfish. While they are cute and unassuming as juveniles, thy require expert care and can reach large sizes necessitating a very large tank.